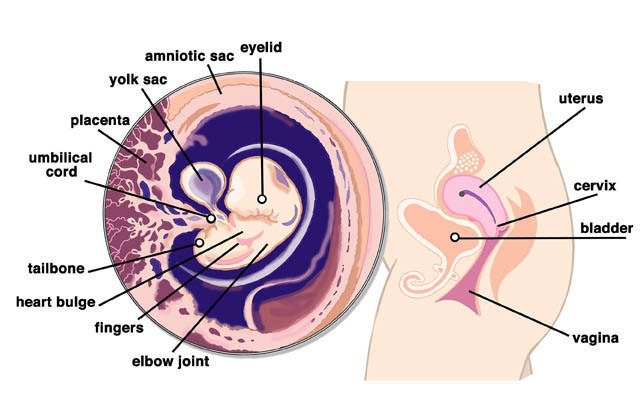 In the seventh week of your pregnancy your baby is about 10mm in length from crown to rump. This may seem tiny, but an incredible amount is happening to this miniature human at the moment. By now, the hand plates are forming, and, although they are webbed, the little fingers and toes are even distinguishable. Eyelids are even beginning to form over the baby's eyes. The tongue and palate are now formed, and small buds are developing which will develop into teeth much further down the line. Did you know that during pregnancy your baby will go through 3 sets of kidneys in total? This week the second set has already developed. You are probably experiencing some bloating but there will not be any sign of a 'baby bump' just yet no matter how many angles you try in front of the mirror! Make the most of it while you can still fit into your normal clothes. Have you noticed that you have a heightened sense of smell now that you are pregnant? This is a common symptom of pregnancy especially after 7 weeks. It is quite normal to find that every day smells such as air fresheners can be quite overpowering. Smells that might not normally get your attention, such as certain foods or the odour of tobacco on a smoker's clothes, might now have you reaching for the sick bag. A number of women find that they prefer not to wear perfume or perfumed cosmetics during pregnancy. As with many of the early symptoms of pregnancy, most women find that this lessens or disappears completely by the end of the first trimester. Make sure that you are letting yourself rest where possible. While the side effects of pregnancy can be draining and even miserable you will probably find that your energy levels pick up and your nausea subsides very suddenly at the end of this trimester. So don't overdo it now, if possible. There may be 101 things on your to-do list before the baby arrives but you don't have to get everything ready right this minute! Social arrangements can be difficult at this time. You may find that you are too tired for social occasions. It can also be draining to maintain a normal persona if your pregnancy is still a secret. If you can cancel one or two events, you will probably find that a well-earned rest on the sofa with some nice food and television for the evening leaves you feeling much better. Never forget how much work your body is doing at the moment, you are growing a tiny person in there so you deserve a bit of time out. Page generated in 1.3199 seconds.